The daffodils outside my office are growing a little bit each day. It may still be March in New England, but the warm weather will be back again soon enough. Time to start planning ahead for promoting your brand outdoors. With this roll-up fleece picnic blanket with nylon backing, you can leave the red and white checkers at home. This colorful gift is a memorable way to liven up a company picnic. 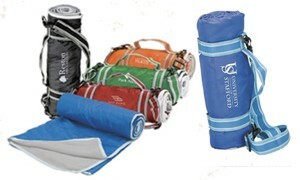 They use it during the event, and then take it home and continue to promote your brand at the beach, lake or soccer field. 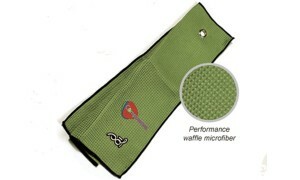 Featuring a unique waffle-patterned microfiber, this towel offers upgraded performance and a striking look for your next golf event. This is a great item for the golf tournament schwag bag. 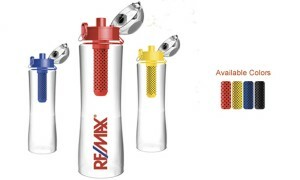 Not only is this sleek, squeezable bottle a great way to stay hydrated in the sun, the activated carbon filter lasts for 200 refills, meaning fewer plastic bottles in landfills. The activated carbon filter removes contaminants from tap water, reduces chlorine and improves taste. Use this as a gift for employees on your charity race/walk team. 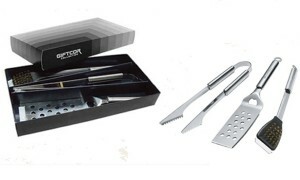 If you’re looking for a grilling-themed gift, this stainless steel set is just about the best value out there. Three essentials to barbeque delight! All stainless steel, it comes with a serrated spatula with a bottle opener to get the barbeque going, a brass grill brush, and scraper tongs. Use this to reward your volunteer “chefs” at your Rotary, Lion’s Club or charity “Town Day” barbeque. The warm weather is a great time to loosen up with your brand and make it fun. Call us for help on how to make it happen.